CasinoBonusNews → Casinos → "Lucky Red Casino review"
If you feel that red is your lucky color, you might want to check out the Lucky Red Casino, an online gambling spot that offers large-pot promotions, fast-paced games and all the thrills you would expect from any casino launched from Real Time Gaming software. From the Web site’s lucky red clover to its 24/7 technical support, players can expect a professional environment while keeping a fun atmosphere and respectable payouts. Once inside, players can enjoy their favorite table games and slot machines, either by using real money deposited in their account, or in practice mode with play money. Among the 120 games on hand are the most popular table games like blackjack, craps, keno and baccarat. Slot lovers have plenty of spins ahead of them, including some machines featuring progressive jackpots. Ten types of video poker are available too, like Deuces Wild or Mystery Bonus Poker. Lottery lovers can try their hand at one of the four virtual scratch cards. 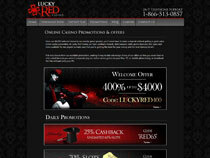 There are so many promotions running at Lucky Red Casino it’s hard to take them in all at once. 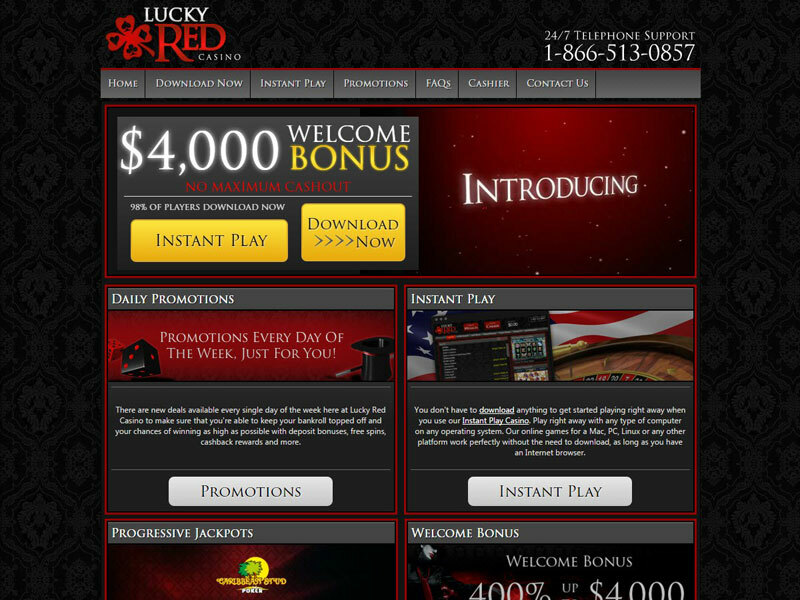 New players can start at the beginning with a welcome bonus that gives away a 400 percent matching bonus up to $4,000. That gigantic chunk of change is worth quite a bit to slot machine players, but blackjack and video poker lovers should take aim with a different welcome bonus. This one promises a 100 percent matching bonus for deposits up to $1,000 that can be used on those games only. Then, visitors must keep visiting the site or checking their mail to keep up with the number of weekday bonuses, weekend bonus codes, special promotions based on holidays, anniversaries, or one even celebrating the birthday of Grover from Sesame Street. Lucky Red offers an incentive to tell all your friends about their casino, which translates into giving you a $50 chip when one friend signs on and deposits money. Complimentary cash also comes in the form of a slot club-like points system, where every $10 wagered earns one point which will then count toward bonuses that can be rewarded by receiving free playing chips outright. This particular casino does all money transactions in U.S. dollars, and while it happily accepts players from the United States, it still accepts players from around the world. Payment methods for Lucky Red Casino are: NETeller, ECO Card, MoneyBookers, MyPayLinQ, Click2Pay, InstaDebit or credit card. The customer can chose any of the same options to withdraw money except for credit cards, or they may have their money returned through courier check, wire transfer or Automated Clearing House. 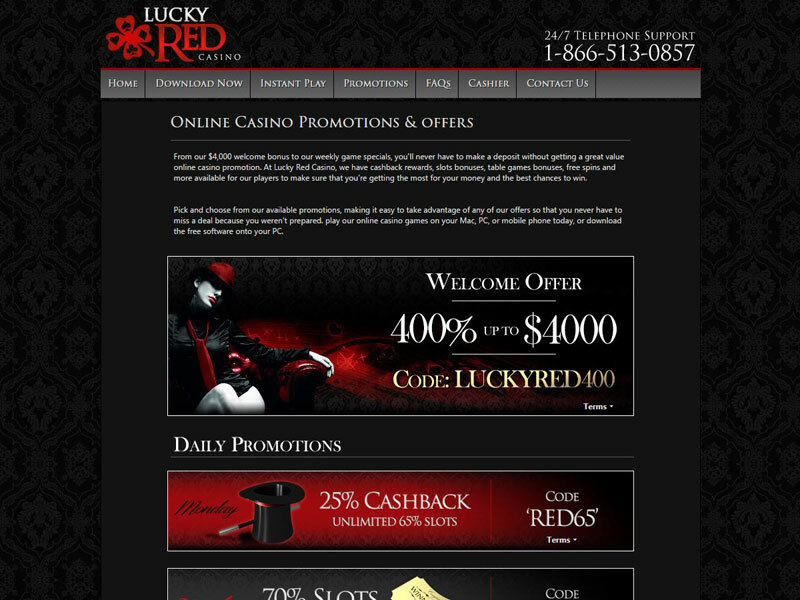 Alongside its games and promotions, Lucky Red Casino proudly advertises its 24-hour tech support. The site’s toll-free number is displayed at the top of every Web page. Users can choose from other contact options, as well. The site hosts a live chat or Email inquiry form. Languages supported include English, German, Spanish and Italian, with English as the primary language. While Lucky Red Casino boasts that 98 percent of its players download the free software, it does offer a Flash-based instant casino for those who cannot use the software version. As stated, the casino is powered through RTG, which comes with RTG’s requirement for the casino to be certified through Technical Systems Testing as a fair site with a working random number generator.